If you are going to get outside investment to start your business, you need to know your initial valuation. Valuation is essentially price. Say you want to bring in $150,000 from an angel investor. The immediate question from the investor will be something like: “at what valuation?” Sometimes that’s called “pre-money valuation,” because the instant the deal happens the valuation will change into post-money valuation, which is always higher — because your company just got some new cash. Your answer sets your deal equivalent of an asking price. If you say $500,000, then you’re offering the investor 30% of your company for $150,000. If you say $300,000, you’re offering 50%. If you say $1 million, then you’re only offering 15%. So how do I know? How do I set valuation appropriately? What is that based on? Is it some multiple of sales, or intellectual property, or what? And that’s a good question, and very hard to answer. Sure, you want some compromise between what you want to give, as a percent of ownership in your company, and what investors would want to buy. Investors will simply say no if it’s not an attractive offer. But that’s still very vague. 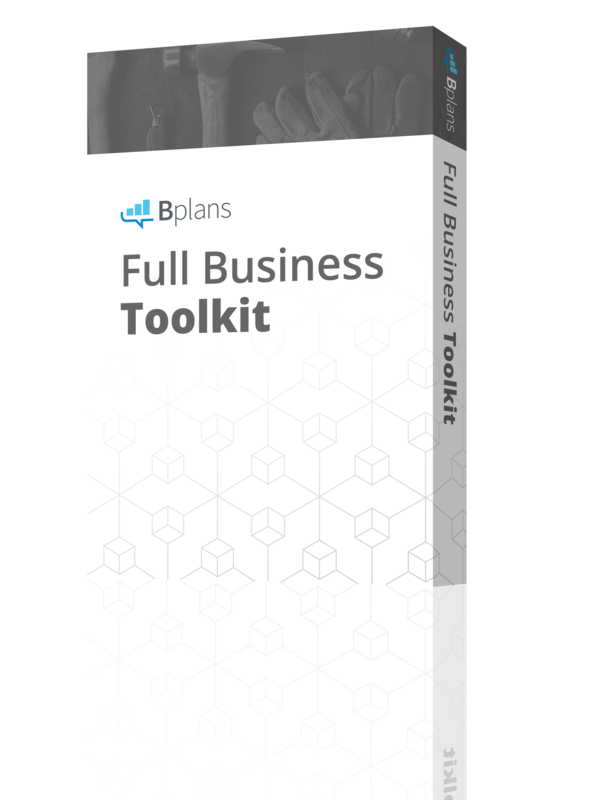 In the case of an existing business, with some history, you do have some formulas you can use. For a great site on that business interpretation of valuation, for existing busineses, I suggest bizequity.com, the zillo of small business. When we’re talking about startups, however, you don’t have history and you can’t really apply formulas based on sales, or revenue, or even intellectual property (although that could be more relevant). Calculate starting costs. That’s two lists, the expenses you have to incur and the assets you have to have at the starting point — except cash. Leave that blank for a bit. Add those all-except for cash assets to the starting costs, to get an amount, a number in dollars. Click here for a lot more on that.So, for example, in the illustration here, that would be about $40,000. Yes, I know it says $38,750, but this is just an estimated guess; always round up. You never guess just right. Calculate cash flow through the lean period at the beginning, before your sales cover your costs. Make a good guess at how much money you need to cover the deficit spending to get you to an operational month-by-month break even level of cash. That’s where the cash requirement number in the illustration came from: it seemed like this company would need about $400,000 to survive from startup to break-even. You can’t see much in the chart below, because it’s small, but it shows a projected 12 months of cash flow (in blue) with a minimum balance, a deficit (in red), of about $400,000. That gives you a number. In this case, it’s $400,000. That’s what your cash flow shows you you’ll need to get to cash-flow break-even. In the last two months, the cash flow is positive, so the negative balance starts shrinking. 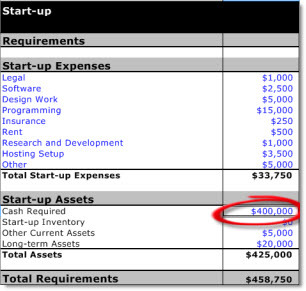 With that estimate as a best guess, you go back into your startup costs calculation, and add in the cash required. It’s $400,000. 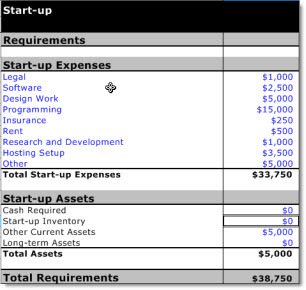 You can see what that does to the startup costs worksheet in the next illustration here. Having done that, you now know that you need about $500,000 from investors (again, technically it’s $458,750, but you’re using best-guess estimates, so round up.) Set that as the amount of investment you’re seeking. Then — and here it gets hard, to be sure — you need to decide how much of your company you’re going to offer to an investor in exchange for that $500,000. Get some help here if you can. Ask somebody with experience in startups, or dealing with angel investors, or both. Ask an attorney you can trust, who should also be somebody with experience. The thing is, how much of your company you offer to investors is about a compromise between what you’d like — none, free money — and what will entice the investors to write checks.At this point a lot depends on your overall business offering, the cards your company brings to the table. Investors want as high return as possible, with as little risk, but in relation to return. How experienced is your team? How defensible is your product? How rich is the market? All these factors determine what kind of a deal will be acceptable to investors. Let’s say, in this case, you’re new at startups, you have very little track record, and you want to attract an active angel investor as a partner. So maybe you set your initial valuation at $750K, meaning you’re offering to give away 2/3 of your ownership to get the money you need. You’re being realistic about what will attract an investor. You better really, really, like that investor, because he or she will essentially own your company. But this is a hypothetical case, and without a lot of experience and defensibility, that may be the best you can do. Or maybe you’ve got better cards to play: you’ve got a team with startup experience, and a defensible new product, with some intellectual property, and it looks like an attractive market. That makes you able to set a stronger valuation, and maybe — we hope — still make it an attractive offer to investors. So maybe you say you’re valuing it at $1.5 million. You’re offering investors one third of your company for $500K. So there’s a quick and (I hope) simple summary of how you set the initial (pre-money) valuation when you want to attract investment.